B2B marketers would welcome the new move from LinkedIn that allows companies to run native video ad campaigns and run video ads on the site. At a time when Facebook is reeling under data breach issues, the new move is sure to bring in a lot of interest and sustained visibility from B2B marketers who are looking for a viable social media channel to tap into leads worldwide. On 29th March, LinkedIn announced two key updates that will be of significant interest to B2B advertisers in the digital space. B2B marketers would welcome the new move from LinkedIn that allows companies to run native video ad campaigns and run video ads on the site. At a time when Facebook is reeling under data breach issues, the new move is sure to bring in a lot of interest and sustained visibility from B2B marketers who are looking for a viable social media channel to tap into leads worldwide. And what better than LinkedIn – the best known and perhaps the world’s biggest professional networking site today. Marketers looking to drive results from video content can count on LinkedIn to provide the much needed visibility and business traction. 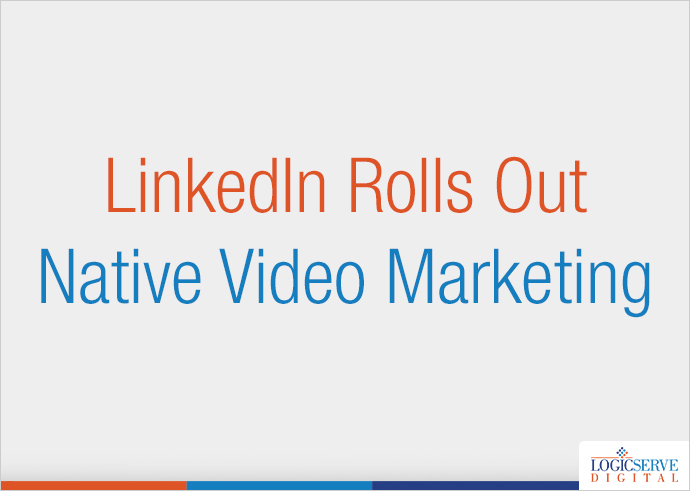 LinkedIn had allowed individuals to add video in native format over the social media platform as late as last August. Many believe LinkedIn is one of the last big social media sites to launch this feature. In order to avoid a similar late-mover tag for B2B too, it has gone ahead and launched native video ads for B2B businesses now. Brands will be able to add videos to their company pages as well as to the Showcase page. The new LinkedIn campaign manager will allow marketers to target audience by specific variables like demographics, job title, or industry. When you use LinkedIn’s Matched Audiences option, you can further drill down your ads to be seen by specific account level audiences. You can also build an email list to reach out to existing customers. Leads are typically generated either by driving site traffic to the company website or via LinkedIn’s Lead Gen Forms product. As expected, the rollout will be a phased one. Businesses are expected to see more features and get access to better functionality in the coming months. LinkedIn had rolled out a phased beta testing for around 700 marketers since October 2017, to track performance and efficacy of the native ad campaigns. Results have been very encouraging from an ‘impressions’ point of view. Viewers have been found to spend 3x the time on average watching ads with videos as compared to static (text/image) ads. In the same beta testing, it saw that Company Page video was viewed 5x more than other forms of content on the Company Page. This will be an encouraging sign for B2B marketers to embrace native ads on LinkedIn with full enthusiasm. Appearance-wise, the native ads will be shown on the News Feed of a targeted LinkedIn member as a standalone, sponsored post. The video will be in auto-play mode by default (in mute version). For analysis purposes, the LinkedIn tracking pixel will come in handy. It will allow advertisers to assess the performance of ads with important metrics like leads, sign-ups, site visit numbers, to name a few. What is your initial assessment of LinkedIn native video ads? Do write to us and let us know your thoughts. Having a hard time generating leads? Twitter can help you out! LinkedIn is a great platform to influence people in your connections. I had never thought about using linkedin as a sharing tool but it clearly is useful.